One of the most interesting periods comic strip history, to me, is the the late 19th and early 20th century, because of the fierce batttles for supremacy between the various newspapers, especially in New York. One of the biggest feuds by far was between the newspapers owned by Joseph Pulitzer and those owned by William Randolph Hearst, and involves one of the earliest newspaper comic strips, "Hogan's Alley," and its most famous character, The Yellow Kid. The strip was created by Richard F. Outcault, but was also drawn for a period by a different artist, the American realist painter George Luks. Luks is best known for his paintings, which have been featured in many high profile museums in the United States. He is most commonly associated with the "Ashcan" school of realism, which also included artists such as Edward Hopper and George Bellows. Like those other American realists, Luks mainly created art that depicted the common, working class residents of New York City, and the real lives that they lived. The people are dirty, messy, and poor, though somehow often still happy despite their lot. It's very interesting, then, to look at Luks' work previous to breaking into the fine art world, as it dealt with many of the same themes. Prior to this, he had quite a long career as a magazine and newspaper illustrator, for publications such as Truth, Puck, Drama, Music, the Philadelphia Free Press, and the Philadelphia Evening Bulletin. His illustrations often involved normal people doing normal things, though often in humorous ways. He was fond of drawing filthy street urchins and old, wrinkly men and women, and buildings and streets did not look much better than the people did. Due to his penchant for drawing these kinds of people and these kinds of scenes, it was no wonder why Joseph Pulitzer chose him for a replacement artist on the very popular comic strip "Hogan's Alley." 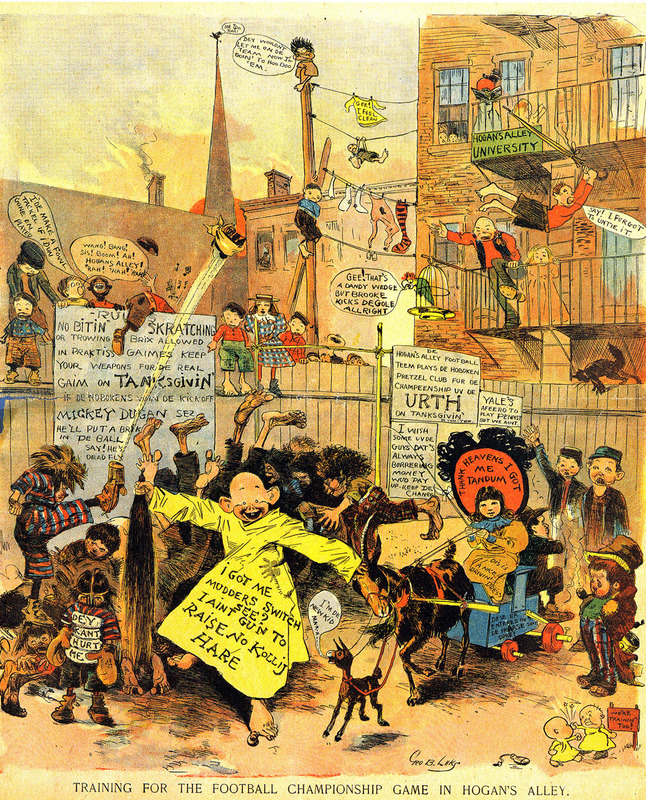 Near the turn of the 20th century, Pulitzer's New York World had become well-known for its inclusion of a comic supplement, mainly due to "Hogan's Alley". When William Randolph Hearst came to New York and purchased the New York Journal, he decided to borrow the idea, and created comic supplements of his own, though he didn't have artists with the amount of name recognition that Pulitzer did. In 1896, however, he hired Richard Outcault, who created "Hogan's Alley" and had been drawing it for the World, to draw it for the Journal, making Pulitzer understandably quite upset. Oucault had been working at the World since 1894, and was obviously quite a valuable asset. Thankfully, a few months before Outcault left, Pulitzer had hired Luks as an illustrator at the World. He tasked Luks with continuing "Hogan's Alley," even though The Yellow Kid would also be appearing in Hearst's Journal. This sparked quite an argument over which was the "genuine" Yellow Kid. Was it the one that appeared in the paper it had originally been published in, or was it the one drawn by its original creator? It was a contentious time, though Luks' strips only lasted until the next year, and Outcault's Yellow Kid strips ended in 1898. Still, among his cartooning colleagues, Luks was seen as an upstart "imitator," and many stopped speaking to him. It was clear they saw the genuine Yellow Kid as being drawn only by Outcault, and blamed Luks for the whole ordeal just as much as they blamed Pulitzer. It wasn't long after this that, though, that Luks began doing fine art and put his cartooning carreer behind him.